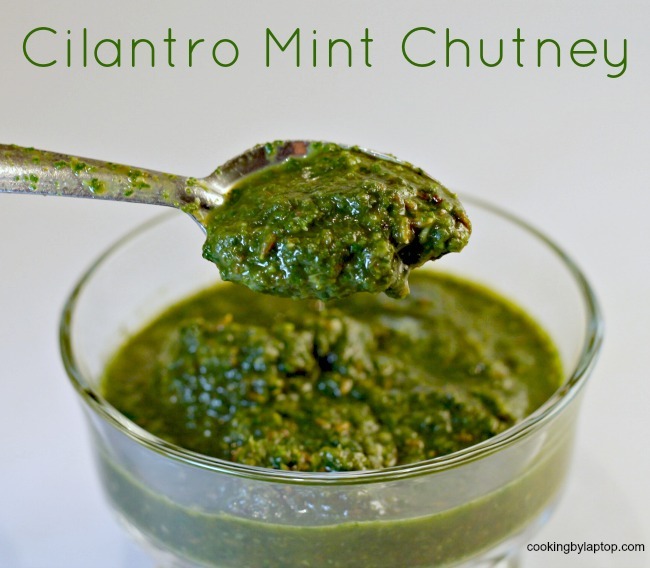 I first had this Chutney at the Food Cart Fest a couple years back. I had it again this past weekend, while doing a cultural food tour in Surrey. Almost everything we ate, including deep-fried Pakoras and Samosas, came with this incredibly fresh sauce, which did a great job of cutting through the richness of the deep-frying. It’s very similar to a chimichurri sauce–a combo of fresh, green herbs, acid, sweet and spice. This would be an amazing condiment with any kind of grilled meat–especially lamb, but you can pretty much pair it with anything, as it packs quite the flavour punch. I love how herbaceous it is–the freshness of the mint and the cilantro, along with a hit of acid in the form of lemon, balanced with the sweet tamarind, and finally, followed up with the spicy kick of the chilies. It’s also really easy to make–no cooking required. Just blitz everything together in your blender until it looks like pesto, and voila! Wash the herbs and remove the bigger, tougher stems. Pack the herbs, garlic, salt and cumin into your blender and pulse to finely chop the herbs. Add the lemon juice and tamarind, and blend well. With the motor running, begin to add the water, pouring it into the top of the blender. Add water until it becomes a pesto-like consistency. You may not teen all the water, or you may need a little more to get it to the right consistency. Taste the finished chutney, and adjust for seasonings–add a little more chili if you like it hotter, more tamarind if you like it sweeter, etc.